SuperCars in Indy — Geoff Wood, coworking guy. The Colts, horrendous as they now are, are not in this game, of course. But when this game was announced I remember the city had some tremendous plans to show off and it would've been neat to see how they take shape. One peice of local flair that I'm very interested is the Super Car promotion between IndyCar and the NFL. One IndyCar has been painted for each of the 32 NFL teams and a 33rd (the number of cars to race in the Indy 500 every year) has been designed to represent the NFL. 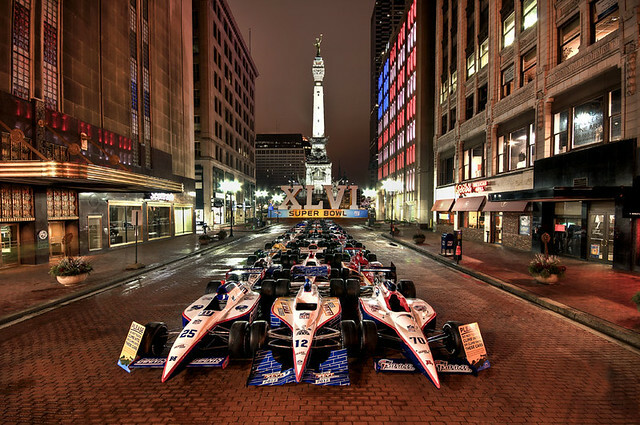 They're arranged in an Indy 500-style starting grid right now in Monument Circle downtown and will be dispersed through the state next week. The Vikings car, which I'm assuming is WAAAAAAAYYY at the back of the photo above, will be going to a Mall in Anderson, IN (according to this) - so if anyone sees it live or finds a photo online, I'd love to see it.